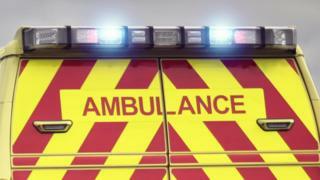 A crew member was struck by a stone thrown through the open window of a moving ambulance while it was on an emergency call, police have said. The medical technician was hit as the vehicle raced along Eaton Road in West Derby, Liverpool on Saturday evening. Merseyside Police's Insp Andrew Gardiner said the man only suffered a minor injury, but "the consequences could have easily been catastrophic". He added that targeting an ambulance was "absolutely abhorrent". A North West Ambulance Service spokeswoman said the "frightening" attack had happened while the vehicle was taking a child to hospital "on blue lights". "After stopping to make sure everyone was OK, the crew continued," she said. She added that the man had been "checked over" at hospital before ending his shift early. Calling for anyone who witnessed what happened to "do the right thing" and contact police, Insp Gardiner said an investigation had begun.